And the Winners Are… • Lime Valley Advertising, Inc.
Lime Valley received three Service Industry Advertising Awards for communication excellence this year. The SIAA is a national competition that honors service industry providers for their contribution to marketing and advertising. In this year’s event, over 1,500 entries from 400 agencies were reviewed for execution, creativity, quality, consumer appeal and overall breakthrough. Lime Valley has earned more SIAA awards than any other agency in Minnesota. Jefferson Lines, a long distance bus/charter company, was looking for a fun new way to present the various routes the company offers. 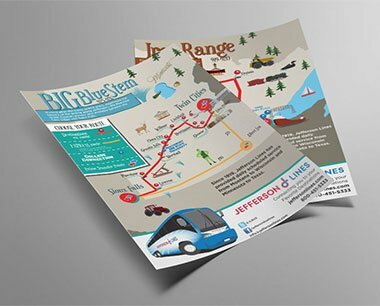 Lime Valley developed infographic maps for six routes that Jefferson Lines wanted to showcase. These engaging pieces presented ordinary information in an extraordinary way, appealing to audiences with color, font, and illustration. The challenge in this project was to create an image for the Southern Minnesota Center of Agriculture that not only portrays key focus areas, but does so in a unique way. The logo places emphasis on natural elements coming together, highlighting their connection to the Center of Agriculture. A contemporary type set is used within the scene, providing a high level of readability while implying a high tech feel. The design created for the Midwest Poultry Federation (MPF) incorporates relatable visuals that connect to the industries served by MPF. The logo has a modern and professional presence, which positions the organization as a trusted resource. The logo design presents a modern twist on a classic style of identity.